This is the new pride of Thessaloniki, a deluxe hotel that also provides casino facilities, only 1km from the Macedonia International Airport. The hotel has 152 rooms and suites, all elegantly furnished, with private facilities (bathtub and shower/W.C), direct dial phone, digital lines with voice mail, A/C, central heating, satellite TV, mini bar, safe box, and have either patio with garden view or balcony. Most of the rooms have king size beds but there are also twin-bedded rooms. Two rooms are especially designed for guests with kinetic disabilities. The general hotel facilities include 24 hour reception, outdoor freeform swimming pool, pool bar & grill, main bar in the lobby lounge serving snacks, cocktails and pastries, 1 restaurant that serves breakfast, lunch and dinner, an entertainment centre with live or D.J music serving dinner, an ultra modern fitness centre with sauna, gym, two-lane indoor lap swimming pool, hydro massage, steam bath, beauty salon, massage and air-conditioned squash courts, two hard-surface tennis courts, parking lot, retail and gift shops, conference facilities (fully equipped) as well as luxurious banqueting facilities (over 1,500sq.m in total). Other services: concierge, laundry and valet service, express check-out, baby-sitting (on request), 24-hour room service. The hotel also organises various activities like mountain hiking, mountain biking, all major water-sports, private boat trips and sailing, horseback riding, vineyard excursions, golf in Chalkidiki. 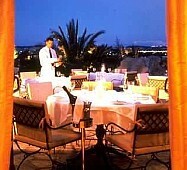 The hotel operates the Regency Club for clients who want a more private setting and personal service. Regency Club guests are served breakfast (continental) in a separate living room, where there are also newspapers and magazines, separate TV system, coffee and tea throughout the day, evening cocktails and snacks. For those who wish to try their luck, the casino is housed in a separate building at a short distance from the hotel facilities (about 1 mile away) and is one of the most modern in Europe.